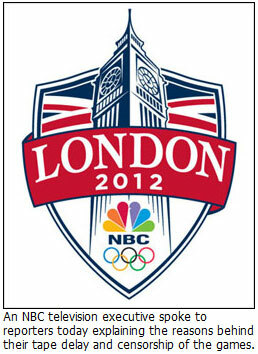 London, UK — NBC has been getting heavily criticized recently for their tape delay and censorship of the 2012 Summer Olympic games being held in London, England. Paul Horner who is a television executive at NBC covering the Olympics spoke with reporters in London today to explain what really happens during these tape delays and censorship of the games. How can NBC get away with this? I demand justice! That is a very long time getting the Tapes from the Days events to Leicester. It’s over 100 miles north of London. So if the Events end at 10pm in London. That’s 5pm in New York. I don’t know how long it take’s to do the editing, but Americans would be waiting “hours”. The BBC in the UK broadcast through the night if the Games are being held on the other side of the World when they were held in Sydney and Beijing. The Olympic Games are the greatest show on Earth, and what they are claiming in this statement, is nothing more than censorship. I call bull crap on NBC’s part. I don’t need or want them deciding FOR ME, what THEY think I can and cannot handle watching. In my opinion, what they are doing is nothing more than corporate greed,plain and simple. What dee said multiplied by a billion, plus 1,000… then add 50 on top of that. That’s a serious number. NBC has no right to do this! Translation: we consider you too stupid and jingoistic to watch an unedited stream of events without the bullsh*t.
Seriously? They think they know what the US public can “mentally handle” and think it’s “fun” to “have a multinational corporation like NBC make your decisions for you about what you like and what you don’t like and when you are allowed to watch what you want to watch”. Could they possibly be any more insulting to their US viewers? I’m not even American and find their comments incredibly offensive. If NBC really “love” their audience like they claim, they’d stop being so insulting and patronising to their audience and start providing the service it sounds like everyone wants and pays for, but isn’t getting. I’ve seen it Do you still think it was adequate behavior? I stopped following the Olympics on US tv, there are many details that are skipped for the sake of publicity. I like to see the divers warming up in the kiddy pool, I like to see the celebration laps after the medals, I like to see the athletes getting pumped before their heat. It saddens me that they cut this stuff out. Man, I wanted to watch the dream team and NBC didn’t let me.